This periodical gives you a monthly update of what's been going on in the field, reviewing significant new caselaw, filings, and appeals on litigation involving two major California statutes: Business & Professions Code §17200 and the Consumer Legal Remedies Act. 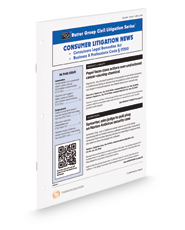 Included are federal and state court rulings, new complaints and appeals on false advertising claims, fraudulent practice claims, deceptive acts and practices, related class actions, defenses, and more, plus cites to the Civil Litigation Series: Bus. & Prof.C. §17200 Practice deskbook where the issues are treated in depth.